This season has been full of a ton of firsts and now that most of it has passed I can say that we are adjusting well. We lucked out with 2 extra weeks of Summer. I was frantically getting paperwork turned into the school as I assumed it started around the end of August and was shocked when I heard them say, "We will see you on Sept. 1st for meet your teacher night" I quickly thought, shouldn't that be before school starts and then noticed that the first day wasn't until after Labor Day. Kylee was absolutely thrilled to discover she had even more time. She was so nervous to start at a new place and I wasn't even allowed to mention the word school the entire month of August. I could barely get her to say 2 words to the principal when we met her. I am happy to say that she is enjoying school and feels totally comfortable there. She is working so hard at making friends and impresses us all the time with how mature she acts about school situations. She goes with a smile and comes home with a smile and that is more than a mom could ask for at this point. On the same day Alexis started pre-school. She is going on Tuesday and Thursday mornings. I would have been a wreck but my parents were still in town and held me together that day. However, it all came out by Thursday as both of my girls were gone again. Lexi pretty much flew right in as she has been excited to have her own experiences but is now struggling a little bit. She looked so grown up with her lunch box in hand and sitting with her little class. One of her favorite things to do is share what she has made in pre-school with Ky when she gets off the bus. My favorite part of the day is the hug I receive when I pick her up. Just a few days later Kylee lost her FIRST front tooth. It is just crazy how different they look once one of these teeth come out. The tooth fairy almost forgot to come and redeemed herself with a five dollar bill!!!! The girls also started their FIRST dance class this fall. Kylee was a little skeptical but once she realized she knew most of the girls in her class from church she was ready to go. 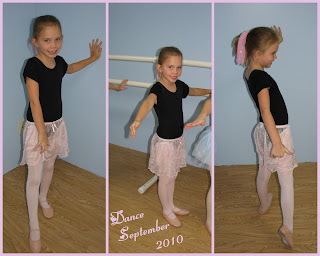 She is willing to give ballet a try in order to have TAP which she enjoys the most. Alexis on the other hand has been all smiles from the minute I mentioned she was going to take dance and insisted on having a tutu. She is just eating this experience up and looks absolutely darling. My favorite part is probably the outfits. I also had the chance of taking Alexis on her FIRST field trip. Despite getting lost on our way and Lexi having 2 different melt downs in front of the class we had a great time together. 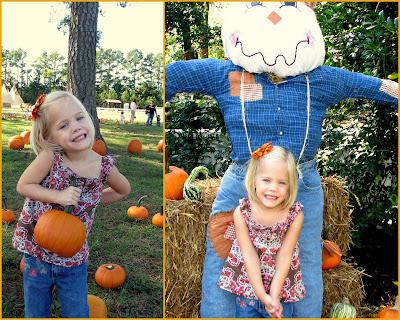 I love getting to spend one on one time with the girls and enjoyed seeing how happy she was at each event. Her favorite was the hay ride. I'm trying to get her to make friends but her best friend is definitely her big sister and she even made sure we took a pumpkin home to her so she wouldn't feel left out. Just a few weeks later Alexis and I joined Kylee on her FIRST field trip of the season to the Zoo. It is always a good feeling to see how excited she is when I arrive at things and I hope that will last forever. I'm sure this is wishful thinking...time will tell. Thanks for the new address. It was so fun seeing all that you are doing. It sounds like you are doing great and we really need to come and visit. Your girls are getting so big. I can't believe we have girls in 1st grade! Oh my goodness! 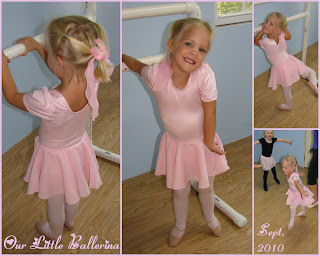 I know I just saw them, but they look so grown up.Darling outfits for their first day of school and I love the ballet pictures - so sweet! Wow!!! Dance class... girls in tutus... sigh! Something I haven't had the chance to do, but it looks so fun! It is amazing how fast they grow up! Nate will be starting kindergarten next year and so it will be just DC and I all day! Your girls are so darling Cheryl! Sure wish we lived closer and could see you more! Wahoo for all the fun firsts and how they are doing at them all. It's so fun to see them growing and branching out, we sure miss them! PS Can your mom find some American Girl dolls at Garage sales for my girls? That is awesome! i can't get over how much kylee looks like you when you are a kid cheryl. your girls are darling!! how fun to start dance and preschool, etc! !